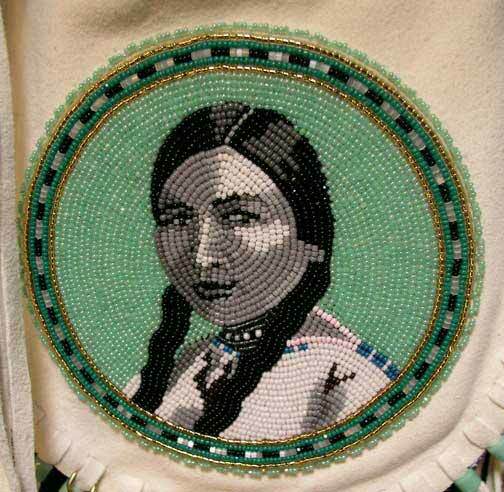 “In 1876, Red Bird was born Gertrude Simmons in Greenwood, NE – the same year as the Battle of the Little Big Horn. She was born to a Yankton Dakota mother and a European-American father. 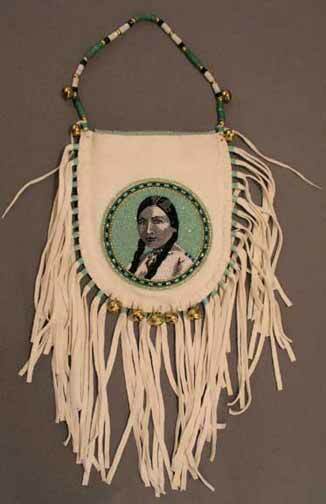 Her Dakota name was Zitkala-sa, meaning “Red Bird”. She attended the Quaker school for Indians in Wabash, Indiana; Earlham College in Richmond, IN; and a music conservatory in Boston. In 1902 she married Raymond T. Bonnin, also a Dakota, and had a son. 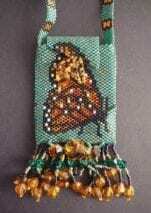 Materials: white buckskin leather, solid brass beads, brass hawk bells, antique green (watermelon) beads, cloth, and glass seed beads (size 13 charlottes, size 14, size 11 delica white satin and 24k gold beads).